Present day national level structures can no longer hope to adequately address the issue of mass migration in an increasingly globalized world and require the development of structures through the collaboration and participation of all countries, a statement by the Baha'i International Community says. The statement addressed to the Sixth Intergovernmental Negotiations on the Global Compact for Migration, calls for a "profound, dispassionate and collective reflection on the underlying conditions that have caused the mass movement of populations." and stresses the urgent need to reexamine systems, structures, policies and attitudes surrounding migration. "Resolving the crisis requires the development of structures able to address the situation globally, through the collaboration and participation of all regions and countries involved," the statement reads. The global compact for migration will be the first, inter-governmentally negotiated agreement, prepared under the auspices of the United Nations, to cover all dimensions of international migration in a holistic and comprehensive manner. The Baha’i International Community has been participating in consultations and intergovernmental negotiations around the Global Compact for Migration (GCM) and Global Compact for Refugees (GCR). Read the statement below. Active in various global fora, the Baha’i International Community maintains representational offices to the UN in New York and Geneva, as well as regional offices in Addis Ababa, Brussels, and Jakarta. The Baha’i International Community registered with the UN as an NGO in 1948 and currently has consultative status with the United Nations Economic and Social council (ECOSOC) and the United Nations Children's Fund (UNICEF), as well as accreditation with the United Nations Environmental Program (UNEP) and the United Nations Department of Public Information (DPI). In the New York Declaration for Refugees and Migrants and the Comprehensive Refugee Response Framework, Member States recognize that “millions of refugees around the world [...] have no access to timely and durable solutions” and that “the success of the search for solutions depends in large measure to resolute and sustained international cooperation”. They further commit “to address the root causes” of violence and other crisis situations which continue to drive people to flee their homeland. In this relation, we would like to offer two thoughts for consideration. Secondly, the current dire humanitarian situation calls for a profound, dispassionate and collective reflection on the underlying conditions that have caused the mass movement of populations. The unprecedented displacement of millions of people globally cannot only be viewed in terms of “managing migration”. It is becoming increasingly apparent that the ongoing suffering of countless individuals who risk their lives for greater security is yet another symptom of a much deeper and far-reaching concern. It represents an urgent imperative to reexamine systems, structures, policies and more importantly the attitudes and assumptions that have shaped them. During the recent UNHCR Annual Consultations with NGOs, the High Commissioner emphasized the need to address the conflicts at the heart of the current refugee and migration crisis. The mass movement of populations has made it clear that the peace, stability and prosperity of different regions of the world are interconnected and that solutions cannot be intelligently considered in isolation from this global reality. Indeed, understanding the root causes of mass migration and displacement and identifying durable solutions for the myriads of crises causing people to flee their homes deserve the highest attention of the international community. For if not through the identification and creation of lasting solutions, how else can we hope to prevent the situation from deteriorating even further? 1. Shoghi Effendi, Promised Day is Come, p. vi. On 25 September will be the 3rd anniversary of the historic adoption of the Sustainable Development Goals, and the UN SDG Action Campaign is organizing to keep up the pressure for transformative change by 2030. • Impact: Take individual actions and/or unite with others to make a lasting change towards SDG achievement. What can you do to take action in your community or area? Post your photos and videos of your SDG actions on social media and the best will be featured in the SDG Media Zone on 25 September at UN Headquarters. The Sustainable Development Goals (SDGs) are quickly becoming not just objectives for the United Nations, other international organizations and national governments, but also the basis for sustainability performance evaluation in companies and local governments. This book by IEF member Joachim Monkelbaan provides a detailed description of the principles and methods for governing the SDGs. The book offers a comprehensive overview of sustainability governance, with a focus on the SDGs. Adopting a unique integrative approach, it examines the fragmentation of governance that is a critical barrier to achieving the SDGs. The main question addressed is: What are the crucial elements and the organizing logic of an integrative framework that is suitable for analysing governance for the SDGs and for implementing the transitions that we need towards a more sustainable world? The findings presented form the basis for a new approach to governance towards objectives such as the SDGs: Integrative Sustainability Governance (ISG). The ensuing ISG framework includes indicator frames within the pillars of power, knowledge and norms. The book concludes that the transformation of crisis into sustainability transitions requires a deeper consideration of risk management that strengthens resilience; systems deliberation that complements democracy; and behavioral insights that elevate human awareness and collaboration. • appreciation of happiness and quality of life beyond material prosperity. This handbook is set to be a comprehensive and valuable companion for students, experts and practitioners with an interest in governance, sustainable development, and the SDGs. Living the Change provides inspirational messages from different religions to motivate their followers to tread more lightly on the Earth. You can click on your faith to open a motivational note that relates some of your faith's teachings to taking climate action. You can choose Interfaith, Baha'i, Buddhist, Catholic, Evangelical, Protestant, Hindu, Jewish, Muslim, and Quaker. Baha'is believe in the oneness of humankind, that we are all one family in the sight of God. We know that poor people are affected first, and that future generations will suffer the most from the devastating impacts of climate change such as more severe heatwaves, droughts, floods, storms, and sea level rise. It is our responsibility to do all we can to reduce the suffering of our family members all around the world. We can all strive to live more environmentally responsible lives and to reduce carbon pollution caused by our lifestyles. Baha'u'llah admonished us to lead a simple life. He wrote that a true spiritual seeker must “be content with little, and be freed from all inordinate desire.” Moreover, He emphasized justice: “Whoso cleaveth to justice, can, under no circumstances, transgress the limits of moderation. The civilization, so often vaunted by the learned exponents of arts and sciences, will, if allowed to overleap the bounds of moderation, bring great evil upon men... If carried to excess, civilization will prove as prolific a source of evil as it had been of goodness when kept within the restraints of moderation...” The Universal House of Justice warns us of materialism and consumerism and writes “Every choice a Bahá’í makes … leaves a trace, and the moral duty to lead a coherent life demands that one’s economic decisions be in accordance with lofty ideals ...” “Let deeds, not words, be your adorning” inspires environmentally responsible actions. The website allows you to write down your personal motivation to change your habits and then provides information about the three areas where all of us can make significant reductions to our contributions to climate change: Transportation, energy use, and diet. You can then choose to make one or more commitments for change in those areas. Then you can download and share a card on social media with a picture and a quotation from the teachings of your faith, and another card with your commitment(s). In this way, you can inspire others to Live the Change! From 7 – 14 October, everyone is invited to celebrate the Week of Living the Change with local events in faith communities around the world. Of course, mitigating climate change requires fundamental societal changes from the local and national to the international level. But the individual actions of millions of people will have a real effect on reducing carbon emissions and will help put in motion large social transformation. Living the Change is an opportunities for IEF members to support a worth-while global effort by their inspiring example. On 5-9 September, Arthur Dahl participated in another of the annual gatherings on everyday spirituality at the Domaine de la Garde near Bour-en-Bresse, France, that bring together representatives of many spiritual and artistic traditions. Participants this year ranged from a former Swiss Minister of the Environment, a Sufi Sheik from Kashmir, a Buddhist monk from Sri Lanka, a Quaker, and a Swedish businessman, to the former leader of the Manhattan String Quartet, a French/Muslim musician of north Indian ragas, a business consultant, and an American professor specializing in native American world-views, among others. The theme this year was everyday spirituality and our economic behaviour, explored from many angles. Arthur presented on rethinking business and the economy based on spiritual principles, drawing on the 2 April 2010 and 1 March 2017 messages from the Universal House of Justice and other Bahá'í texts. Since the present economic system is behind much present unsustainability, transforming the system is an urgent priority, and faith groups are well placed to work for action at the grassroots to change economic behaviour. Despite the great diversity of participants, there was a wonderful spirit of unity throughout the gathering. Participants consulting during a BIC sponsored event that ran parallel to the UN High-Level Political Forum. At the recent 2018 United Nations High-Level Political Forum, held in New York over the summer, the Baha’i community made a number of contributions to the conversation about the role of youth in achieving the Sustainable Development Goals (SDGs), collectively referred to as Agenda 2030. The Forum is an annual gathering of member states of the UN and others to review progress toward the achievement of the SDGs. Delegates of the Baha’i International Community (BIC) included Eric Farr, a Canadian Baha’i from Hamilton, currently a PhD student in the Department for the Study of Religion at the University of Toronto. Farr was part of a Baha’i delegation that included young people from a number of countries, including Ireland and Colombia. They participated in a number of events convened alongside the Forum by the BIC offices. On three consecutive days, panel discussions were held on a number of intersecting themes: the strength inherent in diversity, the construction of peaceful and resilient societies, and capacity building for the transformation of community life. 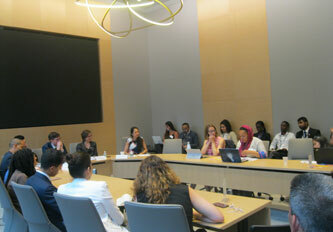 The series attracted a number of high-level participants including Directors and Policy Officers from a halfdozen UN agencies, and Canada’s Youth Delegate for the HLPF. Man of the Trees is available from most online booksellers. Richard St. Barbe Baker (1889-1982) was arguably the first global conservationist, blazing a trail for contemporary environmental leaders such as Jane Goodall and David Suzuki. He began his mission to save the world’s forests in 1922, when he started the ENGO Men of the Trees in Kenya. At its peak, Men of the Trees had 5000 members in 108 countries. It remains active today as the International Tree Foundation, based in the UK, and Trillion Trees in Australia. Baker was a visionary pioneer of concepts and practices such as sustainable development, agroforestry, agroecology, organic agriculture, desert reclamation, fair trade, and ecotourism. Starting in 1931, he wrote thirty books about these ideas. In 1936, he started the journal Trees, which after eighty years is considered the oldest environmental journal still being published. A great adventurer, he travelled the world continuously, networking with conservationists and lecturing on the need to plant trees to save the planet. In addition to kings and presidents, his extraordinary networks of contacts included leaders of thought, visionaries, eminent scientists, artists, eccentrics, crackpots, and ordinary people everywhere who loved trees. Baker inspired many outstanding figures in the forest conservation and reforestation movement, including Felix Finkbeiner (Founder, Plant-for-the-Planet), Scott Poynton (Founder, The Forest Trust), Sunderlal Bahuguna (Founder, Chipko), Tony Rinaudo (Founder, Farmer Managed Natural Regeneration), Vance Martin (President, WILD Foundation), and Hugh Locke (President, Smallholder Farmers Alliance). Through his work and the ripple effect of his indefatigable efforts to promote conservation and reforestation, billions of trees have been— and are still being—planted. Consequently, he has been recognized as one of the outstanding figures of the conservation movement by environmental leaders such as HRH The Prince of Wales, who provided the Foreword for the book, and Jane Goodall, who provided the Introduction. In 1969, The World Wildlife Fund appointed Baker its first Member of Honour. Baker work was profoundly influenced by the Baha’i writings. Shoghi Effendi, who was the first life member of the Men of the Trees in 1929, was a frequently correspondent. Baker represented the Baha’i International Community at United Nations conferences on desertification. For the 50th anniversary of the Club of Rome, whose first report "The Limits to Growth" in 1972 warned of global collapse in the 21st century if we continued business as usual, its current presidents have written a new book repeating that warning, but also looking optimistically at the future. They have drawn on many other distinguished contributors to reflect the best content of progressive thinking. The first chapter describes the many ways that current trends are unsustainable, most of which will be familiar to IEF members. In particular it notes that present conceptions of the world and institutions to manage it evolved when the world was largely empty, while in the last few decades we have rapidly reached what is now a full world, as we overshot planetary boundaries and entered the Anthropocene. Climate change is already an existential threat and accelerating. The chance that nuclear weapons might actually be used has recently increased. The population is still growing rapidly among the poor in some regions while others have ageing populations that are not replacing themselves. More people are crowding into cities, but the agriculture that feeds them is unsustainable. The digital revolution contains both opportunities and threats. Governments have set optimistic goals in the 2030 Agenda, but implementation is far from certain, and there are counter-forces of disintegration. It is a picture of a world in disarray. Chapter 2 is more philosophical, starting with the challenging message from the Pope in Laudato Sí, and then exploring the errors of the market doctrine and reductionist philosophy. It calls for a New Enlightenment based on balance between humans and nature, short term and long term, speed and stability, private and public, women and men, equity and awards for achievement, and state and religion. The half of the book in chapter 3 is full of positive examples of many efforts to build a more sustainable world. They range from a regenerative, blue or circular economy, through energy, climate and urbanization, to the financial sector, investment, economics and alternatives to GDP. It explores collaboration and collective leadership, global governance, and examples of national action in China and Bhutan, closing with a short but excellent section on education for a sustainable civilization. It describes future education as active and collaborative, based on connectivity, value-based, focussed more on the topic of sustainability, fostering an integrated way of thinking and pluralism in content. The Club of Rome has built on its half-century of service to humanity with another important report to prepare us for the challenges ahead, and to inspire us to positive action. Top UN officials welcomed the outcomes of the Global Climate Action Summit that concluded today in San Francisco, showcasing a surge of climate action and commitments from regions, cities, businesses, investors and civil society; and calling on governments everywhere to step up their efforts to tackle climate change. Leaders from all sectors of society gathered at the event to demonstrate how they are ‘taking ambition to the next level’ with a wave of fresh and brave climate action announcements that, if implemented will generate over 65 million new, low-carbon jobs by 2030. Accepting the Summit’s Call to Action on behalf of the United Nations, UN Climate Change Executive Secretary Patricia Espinosa said: “This Summit and its Call to Action make an important contribution towards achieving our collective goal: to keep global temperatures to 1.5 degrees Celsius in line with the Paris Agreement. It will encourage governments worldwide to step up their actions, demonstrating the vital role that states and regions, cities, companies, investors, and civil society are playing to tackle climate change.” The event took place against a background of accelerating impacts of climate change, including Super Typhoon Mangkhut expected to make landfall on Saturday and Hurricane Florence, which continues to devastate communities on the east coast of the United States. "Climate change is undoubtedly the defining issue of our time, and working together across nations, organizations and communities is the only way that we can tackle this enormous task and seize the huge opportunities,” said head of UN Environment Erik Solheim. “We have seen here over the past few days the inspiring amount of work that is already being undertaken by communities around the world to address these issues. If we manage to put our environment first, we can come out on the other end of this formidable challenge and achieve our common goal, a sustainable world for all." Business leaders were fully engaged in the Global Climate Action Summit: “It is clear that enlightened business leaders are taking their place at the vanguard of climate action and seizing the opportunity that this exponential shift to a cleaner and more sustainable economy represents," said Lise Kingo, CEO and Executive Director of the UN Global Compact. "Now we need to ensure that all companies, industries and markets step up to the challenge." Countries and communities around the world are already experiencing stepped-up climate change impacts – including droughts, floods, more intense and frequent natural disasters, and sea-level rise – and the most vulnerable are being hit the hardest. • Under the Paris Agreement, the world committed to limiting the rise in global temperatures to well below 2 degrees Celsius above pre-industrial levels by the end of the century and "endeavor to limit" them even more to 1.5C. • Global temperatures have already risen 1.2 degrees C above pre-industrial levels. Climate change increases volatility and threatens efforts to end poverty. • Without urgent action to reduce vulnerability, provide access to basic services, and build resilience, climate change impacts could push an additional 100 million people into poverty by 2030. • The impact of extreme natural disasters is equivalent to a $520 billion loss in annual consumption and forces some 26 million people into poverty each year. • Climate change is already having real and measurable impacts on human health, with impacts expected to grow. Co-pollutants associated with carbon emissions are already responsible for more than 7 million premature deaths each year, while direct costs to health are estimated to be between US$2-4 billion/year by 2030. • Undernutrition is identified as the largest health impact of climate change in the 21st century. A 6 percent decline in global wheat yields and 10 percent decline in rice yields is expected for each additional 1°C rise in global temperature, with substantial impacts on undernutrition and stunting in food insecure or poor regions. An additional 7.5 million children are expected to be stunted by 2030, 4 million of whom are expected to be affected by severe stunting, increasing to 10 million children by 2050. Climate change is becoming a potent driver of internal migration. • By 2050, according to the World Bank’s recently launched “Groundswell: Preparing for Internal Climate Migration” report, more than 143 million people in three regions, Sub-Saharan Africa, Latin America, and South Asia, could be forced to move within their own countries to escape the slow-onset impacts of climate change, such as water stress and crop failure. • With concerted action, including global efforts to cut greenhouse gas emissions and robust development planning at the country level – this 143m number could be dramatically reduced, by as much as 80 percent, or 100 million people. The financing required for an orderly transition to a low carbon, resilient global economy can be counted in the trillions, not billions. • Over the next 15 years, the world will require about $90 trillion in new infrastructure – most of it in developing and middle-income countries. Making the right choices in favor of infrastructure that is climate resilient and locks in a low carbon development pathway is critical and urgent. Action now will avoid huge costs later. • The IEA estimates that limiting the rise in global temperature to below 2C by the end of the century will require an average of $3.5 trillion a year in energy sector investments until 2050. Climate action is a vast opportunity for sustainable global development, with investment potential in the trillions of dollars and the ability to drive innovation and create green industries and new jobs. • The IFC estimates that the NDCs of 21 emerging market economies alone represent $23 trillion in investment opportunities. • According to IRENA, the global energy transition could contribute $19 trillion in economic gains by 2050. Achieving the goals of the Paris Agreement will require coordinated global action at an unprecedented scale and speed. • The Sustainable Development Goals (SDGs) will only be achieved if tackled along with climate change. The world will soon need to feed 9 billion people while reducing emissions, provide electricity access to 1.1 billion people while transitioning from fossil fuels, and prepare for 2 billion new urban dwellers while reducing the carbon footprint of cities and improving urban resilience. Policy action, including carbon pricing, can help create incentives for change. • Carbon pricing represents a simple, fair and efficient policy option to address climate change. It can also deliver additional benefits, reducing air pollution and congestion while avoiding the increased costs of remedial measures associated with high-carbon growth paths. • For businesses, carbon pricing enables them to manage risks, plan their low-carbon investments, and drive innovation. According to the latest State and Trends report, eight new carbon pricing initiatives have been launched and two more initiatives are scheduled for implementation in 2018. This brings the total number of carbon pricing initiatives implemented or scheduled for implementation to 47. Overall, 67 jurisdictions—representing about half of the global economy and more than a quarter of global GHG emissions—are putting a price on carbon. • However, to shift investment at scale, carbon pricing coverage must expand, and prices must be stronger. Currently, 85 percent of all forms of carbon pricing sets the price at less than $10 per ton of CO2 equivalent. • The High-Level Commission on Carbon Prices, led by Joseph Stiglitz and Nicholas Stern, concluded in May 2017 that a carbon price of $40-$80 per ton of CO2 equivalent by 2020, increasing to $50-$100 per ton by 2030, would allow for the achievement of the core goal of the Paris Agreement – keeping the global temperature rise to below 2C. World Heritage Journeys invites travelers to travel along four cultural heritage itineraries—Ancient Europe, Romantic Europe and Underground Europe —which intertwine to tell fascinating stories of Europe's heritage and history. The website has practical information and tools to support travelers in planning their European holidays based on local knowledge about the destinations’ cultural heritage. “In addition to reaching travelers directly, we hope that the travel industry—including tour operators, travel agents, and local and national tourism authorities—will be inspired by the content we have curated, and will develop and promote authentic tourism that aligns with the goals of the project and reflects the outstanding universal value of World Heritage,” added Ms. Rossler.